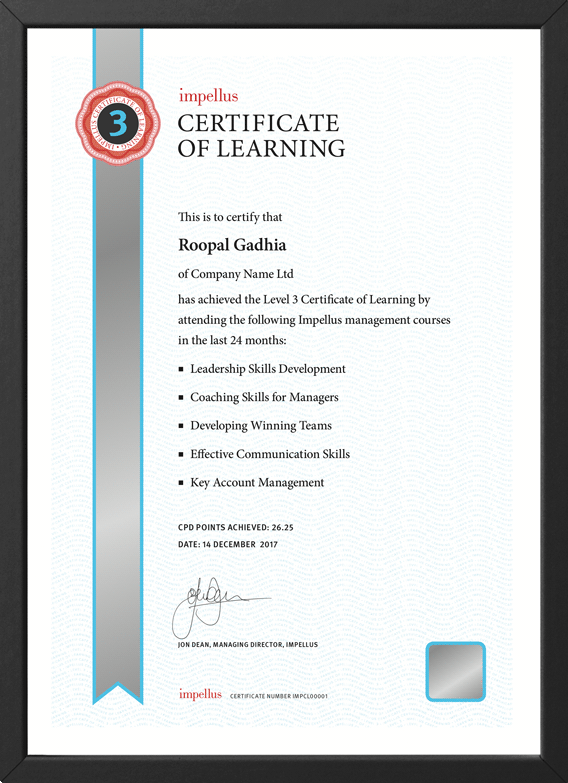 The Impellus Certificate of Learning provides a structured approach to your management development without the time commitment required to complete assessments. It offers recognised learning from the same flexible, consistent, high-quality courses we have always delivered. It’s an ideal formal alternative to the ILM Award. On completion of 5 x 1-day courses (Level 3) and 3 x 2-day courses (Level 5), the Impellus Certificate of Learning formally recognises your delegates’ course attendance, CPD points and knowledge/skills acquisition. The diagrams below illustrate the options available to help you choose between an ILM Award or an Impellus Certificate of Learning. If you have questions, please refer to our FAQs page or speak to a member of our Customer Relationship Team on 0800 619 1230. Details of our ILM courses in Leadership and Management can be read here. If you’d like to know more about the advantages of an ILM Award, please visit our Benefits of an ILM Qualification page. The course material was written by the trainer, who had first hand knowledge and experience, which instils trust. It was most useful having reasoning provided behind all of the topics.